Karl Ward worked in the local school system for 22 years. Image taken from a former Haines High School yearbook. “Four Haines High School alumni came forward this week detailing sexual abuse by former Boy Scout leader, school principal and superintendent Karl Ward, who died 21 years ago. Craig Loomis, Robert Brouillette, Nick Kokotovich and Roger Schnabel allege that Ward fondled them or acted inappropriately toward them while they were visiting at his home. The men decided to speak out after news circulated of Ward’s alleged sexual abuse of Rick Martin. Martin, who killed himself on March 11, left a video on his phone stating he was fondled and later raped by Ward. Loomis graduated in 1969 and played basketball for the Haines Glacier Bears. Loomis told the CVN on Monday that Ward invited students to his house and offered them alcohol. During one such encounter, when he was around 16 or 17 years old, Loomis said Ward “inappropriately touched” him. He said there are likely more victims. “I don’t want to mention any other names, but I’m sure there’s probably more than a couple,” Loomis said. Brouillette played basketball with Loomis. He said he was staying at a teacher’s home at the time who asked him to go to Ward’s to get keys to the school. Brouillette said he told the teacher who he was living with what Ward had done to him. The teacher did nothing. Schnabel also played basketball. He graduated in 1973. Similar to the others, Ward invited Schnabel to his home. Schnabel said Ward had been drinking and was slurring his words. They were in his basement. The men who spoke out believe Ward’s sexual abuse was an open secret in Haines that should be acknowledged. Two school staff members- friends of current school principal Rene Martin, widow of Rick Martin-took down a sign last week that named the school gym after Ward. The sign was hung in 1994. Ward, originally from Philadelphia, joined the Navy in 1942, according to records obtained from the Haines Sheldon Museum. He was discharged in 1945. Two years later he joined the National Missions of the Presbyterian Church and was sent to Haines. He worked as an assistant farmer and maintenance man at the Haines House, a place where Native children lived who were orphaned, wards of the state or who lacked schools in their remote communities. He later returned to Pennsylvania and obtained a masters in education. In 1954, he accepted a teaching position at Haines High School. He became the principal three years later. In 1960, the Presbyterian Church closed Haines House. Ward fostered four boys who left the orphanage. In 1967 he was hired as the Haines School superintendent. Ward was also active in the Boy Scouts. He remained single until he was 46 years old. Ward retired as superintendent in 1976. Ward was active in Glacier Bears basketball. He served as a scorekeeper and travelled with the team. Ward also had the boys rub his head for good luck before taking the court. He died in 1997. According to CVN records Ward received awards from students, local teachers, businesses and the University of Alaska. He was twice given an award for contributions to student activities. 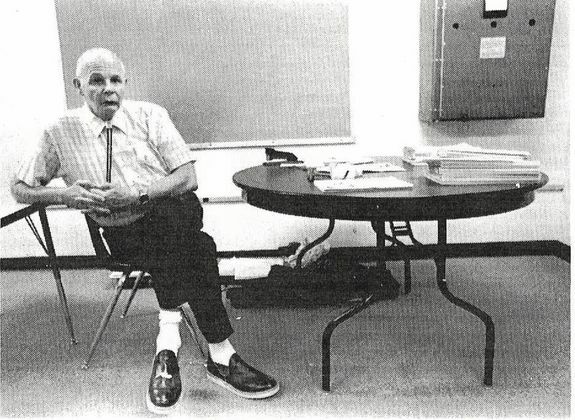 The University of Alaska Southeast gave him a meritorious service award for his work in education and his “strong, positive influence on youth,” according to a December 1989 “Southeast Log” article obtained from the Sheldon Museum. The CVN reached out to Ward’s former coworkers and administrators to see if they were aware of rumors or alleged abuse. “I have no comment on that issue now or ever,” former principal Alan Heinrich said. Gary Matthews was a music teacher from 1968 to 1979 and the principal from 1979 to 1993. He said he thought it was somewhat unusual that Ward had students over to his house, but chalked it up to Ward not having a family. Other Haines residents said they believed for years that Ward abused kids. Others say they are shocked. One Haines graduate said he named his child after Ward. Norm Smith, who attended school from the seventh grade until he graduated, said he had never heard any such allegations against Ward. It’s doubtful whether anyone would be hearing about Ward now were it not for Martin’s video, and his wife’s decision to share it publicly. Rick Martin, who worked in the school, told his wife that is was difficult to be in same hallway as the sign commemorating the gym’s namesake. Phillip Jackson said Martin told him about Ward’s abuse in the late 1980s when they worked together logging. When he was a child, Jackson said a male relative sexually abused him. Loomis said he’s willing to talk to anyone who was affected by Ward and organize a meeting with anyone who wants to talk. Lynn Canal Counseling is offering walk-in services and staff will be available with or without an appointment. Haines Borough police chief Heath Scott met with Mayor Jan Hill, borough manager Debra Schnabel and other community leaders after police found Rick Martin’s video. He told them there’s a chance more victims, from multiple generations, will come forward. He said Ward’s status as a respected community leader indemnified him from public criticism for years, starting with his involvement at the Haines House. Scott encouraged other victims who might seek help to call the SEARHC crisis hotline at 1-877-294-0074 or Lynn Canal Counseling at 766-6383.